The Boston Terrier (sometimes called the Boston Bull Terrier) is generally alert, very intelligent and enthusiastic. This breed seems to have a sense of humour and is sensitive to the tone of your voice. Although their intelligence ensures they pick things up quickly, it also allows them to be wilful. Some owners say they make good watchdogs, barking only when necessary – although some do not bark at all! 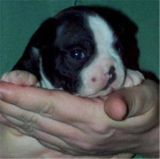 Boston Terrier puppies are reliable with children and especially good with elderly people and friendly with strangers. 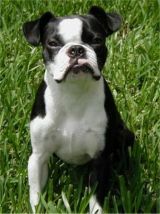 Boston terriers are playful and very affectionate and enjoy being part of the family. They are very popular in America, due to their excellent temperament - they generally get along with other pets, although can be difficult to housebreak. First bred as fighting dogs, today's Boston Terriers have been bred to be less aggressive, being gentle and well mannered in most cases. Our 4 Paw Rating - to the suitability of the Boston Terrier for your home and lifestyle.